Ericco Manufacturing Specializes in Production CNC Machining, Stamping, and Forming to Customer Specified Designs. 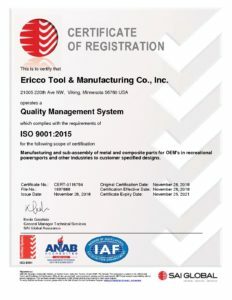 Ericco Manufacturing is registered to ISO 9001:2015 by SAI Global. Our Production Department is capable of producing high quality parts at both high and low run volumes. Our Quality Department utilizes state of the art inspection equipment to ensure product quality and accuracy per customer specifications. Our Tooling Department is capable of designing, developing, and fabricating custom tooling in order to produce parts that meet customer specifications. Are our services a fit for you? Contact us to submit a quote request. We would be happy to discuss options!